Captain Blood contains the kind of effortless spirit only Golden Age entertainment can bring, offering refined escapism, without the hindrance of imbedded tongue-in-cheek irony to shirk the sincerity of its story. This is adventure, pure and simple. The film progresses with speed and invention, both signatures of experienced studio filmmaker Michael Curtiz, who had already made more than a hundred features by the year of the film’s release in 1935, most of them now lost. Timeless in its appeal, the swashbuckling film exists as a faultless example of Hollywood filmmaking during the studio era, and the first in Curtiz’s productive and criminally undervalued career. Curtiz was already well-established as a creative director in Hungary when, in 1926, he followed the path of other European filmmakers like Ernst Lubitsch to Hollywood. 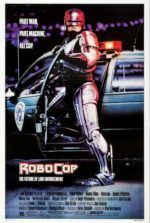 He went under contract with Warner Bros. and adhered to the rigorous procedures of the studio system to helm sometimes five or six pictures every year, most of them of low priority and budget. Not until Captain Blood did he become one of the studio’s top directors. 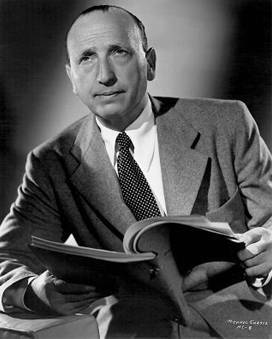 And despite his subsequent filmography, including such incomparable classics as Casablanca and Yankee Doodle Dandy, Curtiz is overlooked as the creative force behind these pictures by film scholars and critics, who prefer to credit the collaborative nature of the studio system for the artistry present in his films. His benchmark swashbuckler notes several milestones for Hollywood history. It was the first leading role for newcomer Errol Flynn, a rambunctious Tasmanian with a nimble physical presence and reputation for womanizing. It would be the first of nine onscreen appearances together between costars Flynn and Olivia de Havilland, both virtually unknown Warner Bros. contract players at the time. But it was the second of twelve collaborations between Curtiz and Flynn, preceded only by The Case of the Curious Bride from earlier in 1935, wherein Flynn appeared as a corpse. What a leap Flynn makes in one year, from an extra—a dead one in the backdrop, no less—to headlining an A-list picture. Costume dramas were making a comeback in Hollywood, since in those days such films avoided modern allegory that might draw attention from the Catholic Legion of Decency, established the year prior to Captain Blood’s release. Warners obtained the rights to Rafael Sabatini’s 1922 novel Captain Blood: His Odyssey after buying out the small studio Vitagraph. Curtiz was selected as director by top Warner producer Hal B. Wallis and the screenplay was adapted by Casey Robinson, a Warner contract writer later responsible for Now, Voyager and Passage to Marseille. Robert Donat was originally cast in the title role, a deal which fell through last-minute. And so, Jack Warner took a risk on the young Errol Flynn after admiring the actor’s brash confidence during a test screening, though undoubtedly his decision of casting a no-name star in a big budget picture was also fueled by financial concerns. Budget projections were over $1 million with Donat as the lead; casting Flynn brought the cost down considerably. The story follows Doctor Blood (Flynn), accused and arrested for treason when he helps a wounded man, a treasonous rebel against King James II. Sentenced to slavery in the West Indies at Port Royal under the cruel Colonel Bishop (Lionel Atwill), Blood falls for the Colonel’s niece Arabella (De Havilland). Keeping away from Bishop by treating the local governor and healing his Excellency’s gout, Blood is also protected by Arabella, as they share a mutual unspoken affection. Still, despising slavery, he plots a getaway and escapes when a Spanish ship attacks the port. Blood captures the Spanish vessel and turns its cannons on the raiders, saving the port city, ever loyal to England despite the current king and his imprisonment. Along with his band of former slaves turned “brotherhood of buccaneers”, he forms a pirate clan dedicated to raiding ships in the Caribbean to reclaim their sense of freedom. Meanwhile, Blood yearns for the love he left behind with the dear Arabella. Preceded by a reputation for being the smartest man on the ocean, pirate or otherwise, Blood forms an alliance with the most powerful pirate, a French scoundrel named Levasseur (Basil Rathbone). Together they plunder the seas, until Levasseur captures a ship carrying Arabella and Lord Willoughby, an emissary for the newly appointed King William III. Threatening to take Arabella as his own, Lavasseur is outsmarted by Blood, and attacks him for it. They clash swords in a dance on the beach, which brings Levasseur to his death and Arabella back into Blood’s life. Not until Blood proves his years of piracy are in the past, by accepting Willoughby’s offer of pardon from the new king and defending Port Royal against warring French ships, do he and Arabella finally embrace. Ripe with prison escape, swordfights, sea battles, and romance, Captain Blood presents an archetype for all successive pirate yarns. The entire picture is told with an air of sophistication, starting with Robinson’s layered dialogue. Blood, described as having a “rascally mouth,” is given a sharp tongue to match his intelligence. He and Arabella always seem to have two conversations, one with their words and another with their eyes, the charisma between Flynn and De Havilland fueling them both. Characters speak in metaphors and ingrained wit, yet they are joyous and filled with humor. 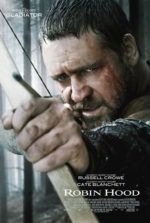 Moreover, opera composer Erich Wolfgang Korngold, who would go on to pen iconic scores for The Adventures of Robin Hood and The Private Lives of Elizabeth and Essex, wrote his first music for the cinema and adds another level to the rich dialogue in his insightful orchestration. Action sequences pop with Curtiz’s swift camera and active compositions. Filming the bravado battle scenes with miniature ships, process shots, and footage from the 1924 silent The Sea Hawk (not to be confused with the 1940 Curtiz-Flynn collaboration of the same name), Curtiz ignored most input from Wallis, particularly when the production went over budget. Unlike his later pictures such as Casablanca, Curtiz avoided executive influence; instead, he shot fast and trusted his own instinct. 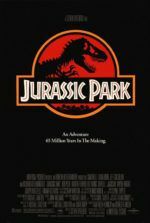 Filming took place on soundstages reinforced with elaborate set designs and matte paintings. The Blood vs. Levasseur duel was filmed on the rocks at Laguna Beach, allowing the crashing waves to punctuate the violent struggle. In the early weeks of filming, Flynn’s unproven skills in front of the camera left him shaking with nervousness. His initial rigid acting and his greenness as a leading man eventually loosened during the progression of the shoot. The visibly tense actor was coached in his first starring role by Curtiz, on order from Wallis telling the director to “work with the boy.” Flynn improved so much that scenes shot with the actor early in the shoot were refilmed by Curtiz, who realized that Flynn just needed time to gain his onscreen confidence. Once attained, Flynn’s self-assurance fueled his natural charm and agility to carry the role, so that the end result seems like the performance of a longtime star and cinematic hero. By the time all the retreading had been completed, the budget was back up to nearly a million. Nevertheless, the film earned Warner Bros. hefty profits domestically and overseas, solidifying Curtiz’s place as a profit-turning director, and Flynn as a leading man. Described as a “taskmaster” by those who worked with him, Curtiz also maintained the reputation of having a short temper, shouting slurs and abuses at his cast and crew when production troubles arose. His thick broken-English accent amused others not on the receiving end. The most famous comic tale of Curtiz’s exploits remains David Niven’s recollection from the set of The Charge of the Light Brigade, when Curtiz shouted “bring on the empty horses,” angrily referring to horses without riders. Similar accounts of Curtiz’s eccentricities, temper tantrums, and language barriers pervade anecdotal Hollywood lore, helping to sketch a gruff exterior portrait without much illumination of the man behind the dictatorial director façade. The prolific string of collaborations between Curtiz and Flynn supplied Warner Bros. with their most successful films in the coming years. 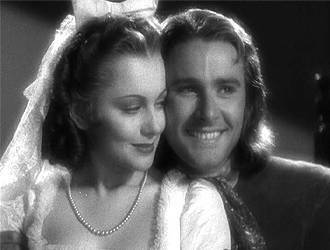 Both artists proved their versatility by making period epics, romances, Westerns, still more swashbucklers, and even a comedy together. Yet their partnership was not a pleasant one, as Curtiz’s production rage proved intolerable, and Flynn was hardly the type to back down from confrontation. After an on-set argument became violent, Flynn made sure the two would never work together again. Their last film together was the air force medical drama Dive Bomber from 1941. Curtiz focused on the job, enough so that an informed offscreen persona is impossible to construe outside his obvious professional devotion to the assigned picture. What stimulated his ever-constant tension during production remains a mystery, if anything beyond his drive for perfection? The few biographies written about him focus on the work and rarely elucidate the man behind it. His commitment to the quality of his films extended to a notorious lack of consideration for his cast and crew, including some unfortunate deaths caused by stunts-gone-bad in the name of realism. 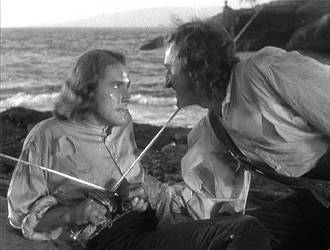 On Captain Blood, during the swordfight between Flynn and Rathbone, Curtiz wanted to see the fear of death in the actors’ eyes on film, so he removed the safety cap from the end of the swords, making his actor-combatants duel without protection. The actors engaged, following the innovative fight routine sketched out by legendary swordplay expert Fred Cavens, who later arranged the swordfights in The Adventures of Robin Hood and The Sea Hawk. Rathbone, an experienced fencer, took a particular dislike to Flynn and left a scar on his costar’s arm. But never had audiences seen such an intense onscreen clashing of swords, and that was Curtiz’s priority. As early as 1917, Curtiz purveyed and supported an early version of the auteur theory, suggesting, like many of his European-born contemporaries, that a film’s director stands at the helm of a production. He famously compared the frame, complete with players and setting, to an unfinished canvas on which it was the director’s task to compose like a painter. And so, how unfair that Curtiz is pinpointed as some trifling studio workhorse slaving away in the factory on the Hollywood assembly line. Especially when considering so many of the director’s signature technical moves that so advance his screen stories. Critic Andrew Sarris wrote in his prominent article “Notes on the Auteur Theory,” the Americanized answer to François Truffaut’s original treatise in Cahiers du Cinéma, that he believed Curtiz little more than one of “Warners’ technicians.” And while Sarris admitted Casablanca was the director’s masterpiece, he argued that “If many of the early Curtiz films are hardly worth remembering, none of the later ones are even worth seeing.” Looking at Curtiz’s filmography and seeing Angels with Dirty Faces, Dodge City, Flamingo Road, Mildred Pierce, The Sea Wolf, and Young Man with a Horn, among many others, how does Sarris wave-off this ongoing roster of classics and conclude that the director was merely a stooge for the studio lacking any artistic influence over his productions? Perhaps Sarris’ view stems from Curtiz not playing the self-obsessed auteur card like so many he referenced in his article. Since Truffaut coined the terminology himself, he represents the standard example, talking with directors like Alfred Hitchcock at length about their output in scholarly interviews, detailing their manipulation of the cinematic apparatus to fit their artistic schema. Curtiz died before interest in his potential auteurism flourished. Furthermore, the filmmaker was not known for his candid discussions about his expertise with either film scholars or the press; he also refused to write an autobiography, hence like many early filmmakers who died before film theory became a vast subject of intellectual study, his personal philosophy on directing is not known. The chief discussion against Curtiz’s individual talent settles on his late career, when the studio system was dying and all cinema was on the decline. Few Golden Age filmmakers working in this era, including undisputed auteurs like Billy Wilder and Orson Welles, were making films that compared to the stylistic precision of their earlier work, then backed by the studios. Throughout the fifties, without the studios supporting him with seemingly endless means, Curtiz’s artistic and commercial output waned. The mark of an auteur is said to be a thematic and likewise technical signature, but herein resides the fault in Truffaut and Sarris’ arguments, because a filmmaker evolves so that their signature changes over time. Certainly an auteur’s focus develops or deviates from their prime period. Even Truffaut’s own directorial renaissance in the early 1960s all but fizzled away in the subsequent decade. To conclude that Curtiz’s merit as an artistic figurehead of his time is lacking because he functioned within the system and reached his apex before he could be studied is ludicrous. Hitchcock, Wilder, Hawks, Huston—they all worked within the system, and they all receive their accolades from Truffaut and Sarris. Where the dilemma emerges with Curtiz is his willingness to make whatever the studio asked him to direct, and then through his compliance he becomes the top director for the Warners. Furthermore, his style is impossible to pinpoint because he refused to reduce himself to a particular “type” of film. Hitchcock had wrong-man thrillers and the macabre. Hawks made screwball comedies and blithe actionized Westerns. Curtiz could make anything, regardless of genre or tonality, thus his individuality within a production is more difficult to identify. It is perhaps simplest to describe Curtiz as an exception to the auteur theory, a master whose chief drives were the speed and quality and financial practicality in which his films were made. This equation, however restrictive for an auteur’s freedom, results in Curtiz’s undeniable gift as a filmmaker. 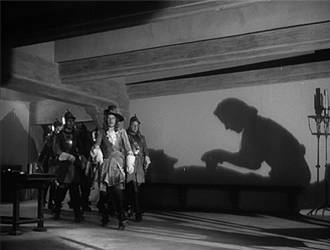 Consider Curtiz’s signatures present in Captain Blood, however overlooked by Sarris. His camera constantly moves, wrapping around a scene and giving the viewer a clear impression of the environment, versus the point-and-shoot approach dealt by many Hollywood directors of the era. The camera pushes in to emphasize dramatic potency or need, and then pulls away to signify isolation, sometimes within the same take. He activates inactive scenes by projecting massive shadows onto blank walls and inscribes every shot with dynamic lighting. He employs these tricks of the trade at just the right moment, setting everything onscreen into a composed harmony, regardless of the picture’s genre. His range transcends those of his colleagues, and though not qualifying for every statute inscribed in the subjective definition of the auteur theory, Curtiz’s approach remains that of an impeccable craftsman. In terms of influence, both the film and its star have been replicated to no avail by subsequent swashbucklers. The Black Swan starring Tyrone Power from 1942 and even Curtiz’s own The Sea Hawk lift from the director’s design. Indeed, never was there a Hollywood pirate film that failed to look back to Captain Blood for inspiration. 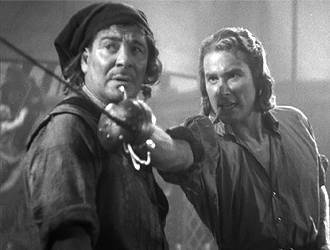 Even modern swashbucklers like Cutthroat Island and the Pirates of the Caribbean Trilogy reach for the glory and fervor of Curtiz’s picture and the appeal of Flynn’s performance, without ever attaining the simplicity and acumen of the original. 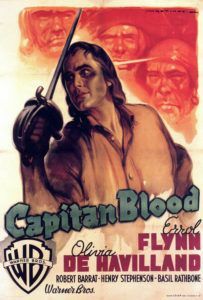 These later films always wink into the camera with a sense of satire, whereas Captain Blood succeeds wonderfully on its own spectacle. 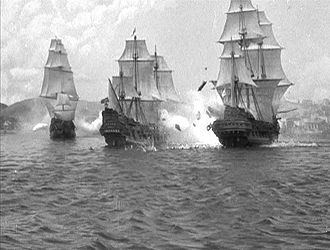 Throughout Captain Blood, thrills never cease from the beach duel between Flynn and Rathbone to the impressive final ship battle. Cannons roar and pirates swing on rigging to enemy ships, fast-paced swordfights clang, while Blood shouts rousing words for his men. Flynn exudes all the traits of the real thing, jumping into combat with that signature spring in his stride. Sweeping camera movements catch this action, just as more delicate moments are supplied the necessary affection. Arabella’s contrasting fascination yet frustration with Blood’s quest for freedom is captured in delicate, soft-filtered shots. And when the characters embrace, De Havilland places a kiss on Flynn’s cheek, as sweet a moment as any Golden Age picture could offer. These are moments made sublime by Curtiz’s expert handling, and suggest he was much more than the “workhorse” label assigned to him. Emblematic of Curtiz’s most landmark directorial efforts, those with actionized narratives to exhibit his vigorous camerawork and lively frame, his first grand success with Captain Blood lasts as a timeless entertainment with unmistakable romantic appeal. It reminds us why Warner Bros. was the studio for action, why Errol Flynn became their greatest action star, and why De Havilland was so respected. There was never another pirate adventure so fundamentally enjoyable; it remains distinguished in its clarity and yet elegant enough to engage the viewer. Later pirate swashbucklers used it like a textbook, following its bravado blueprint without ever mastering its singularity. Flynn, Errol. My Wicked Wicked Ways: The Autobiography of Errol Flynn. Bloomington, Ind. : Third Woman Press, 1987. McNulty, Thomas. Errol Flynn: The Life and Career. Jefferson, N.C.: McFarland, 2004. Robertson, James C.. The Casablanca Man: The Cinema of Michael Curtiz. London; New York: Routledge, 1993. Rosenzweig, Sidney. Casablanca and Other Major Films of Michael Curtiz. Ann Arbor, Mich.: UMI Research Press, 1982. Sarris, Andrew, “Notes on the Auteur Theory in 1962,” in Film Theory and Criticism, ed. Leo Braudy and Marshall Cohen. (New York: Oxford University Press, 1999), 515-518. The Adventures of Errol Flynn. Dir. David Heeley. Prod. Top Hat Productions, Turner Classic Movies (TCM), 2005.